If you're planning on getting in shape this year, but know that you'll just end up sitting on the sofa all year playing video games, then I think I found the perfect compromise with this cool new VirZOOM. This innovative exercise bike combines virtual reality gaming with fitness cycling, because its no fun staring at a wall while you pedal away. 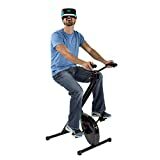 To play/exercise, just get on the bike, slip on a compatible VR headset of your choice (not included), choose one of many different free VR games to play, pedal to move faster and faster, steer by leaning side to side, and interact with the games using the integrated game controllers on the handlebars. Just imagine pedaling along with other virtual reality cyclists through a lush countryside, racing around around the track in a race car, flying a majestic pegasus through the air, kayaking down a river, riding a horse while trying to lasso up bandits, driving a tank into battle, and more - all in immersive VR. This might be the first time that your clothes end up hanging from the abandoned television instead of the exercise bike. Check out this video to see it in action. Cool huh? Turn your home training device into fun with this app! Cowboy: Jailbreak! Lasso bandits off horses and throw dust devils. Kayak: Lotus Pond. Find ducks for grandmas to feed during the day, and at night lead fish to underwater gems. Cycle: Le Tour. Ride a bicycle through the countryside, drafting behind other cyclists to conserve energy and meeting a new goal every kilometer. Racecar: Curvy Race, Oval Race. Race AI, live players online, and the ghosts of your own best laps on different tracks. Tank: Winterstan. Battle against tanks and mechs controlled by AI and up to eight live players online at a time.